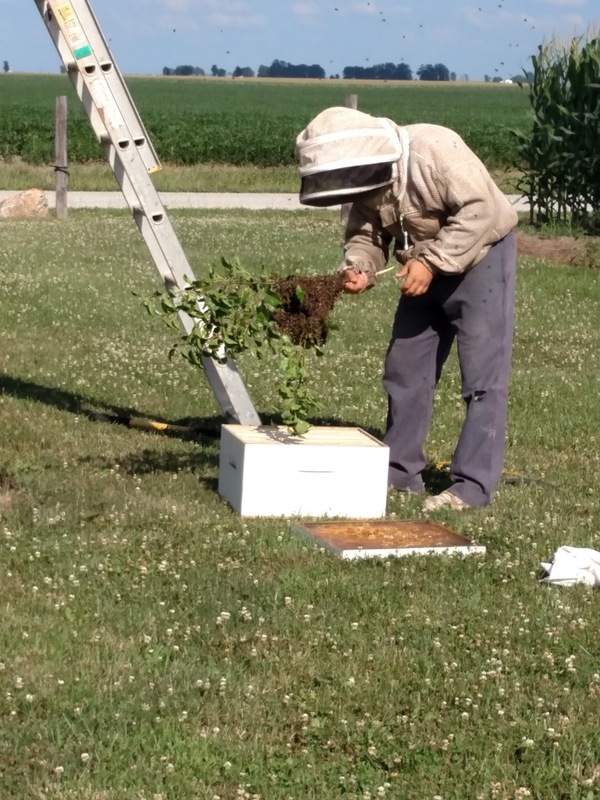 We started our Bee journey in 2015 with 1 hive and the desire to Bee Good Stewards of our land. There have been challenges along the way along with many blessings. As of 2018, we have 5 hives going strong and producing some of the best honey we have tasted. This year we have started infusing some of our honey with Turmeric for additional health benefits. Our Butterfly Weigh Station is right beside our Hives. The bees and the butterflies both like the same pollinator plants. We continue to add more pollinator flowers every year. This year we added Purple coneflowers and Cosmos. We talk about Bees anytime anyone asks us and want to continue to share and inform about the importance of Bees to our very existence. This year we were asked to speak to several classes at Lake Land College about the impact of the Bees on our surroundings. We were very pleased with the amount of enthusiasm the students showed and the terrific questions that were asked. One of the many projects that I enjoy doing is using beeswax in the products that are made here on the farm. We are currently adding them to the website store and by Spring 2019 we hope to have “Simply Bee” farm store open to our guests and the general public. 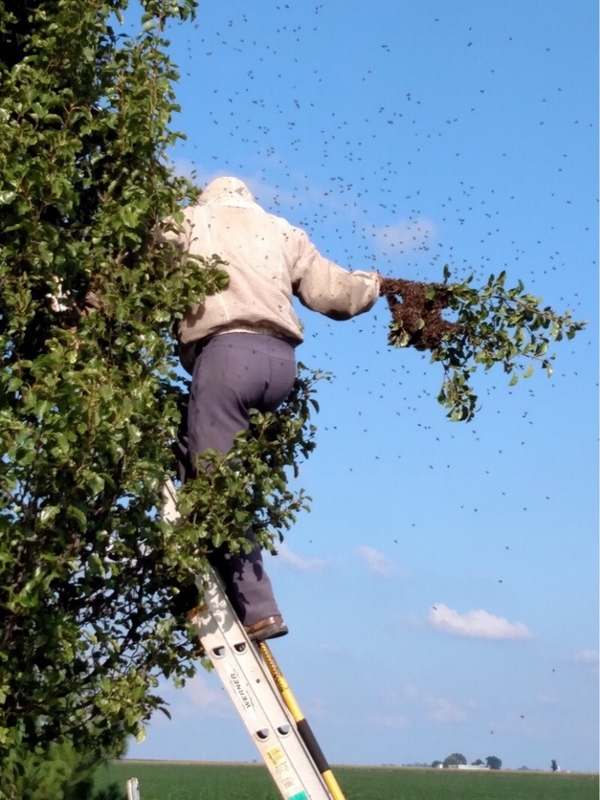 Bee Hive removal is another project that we did this year. 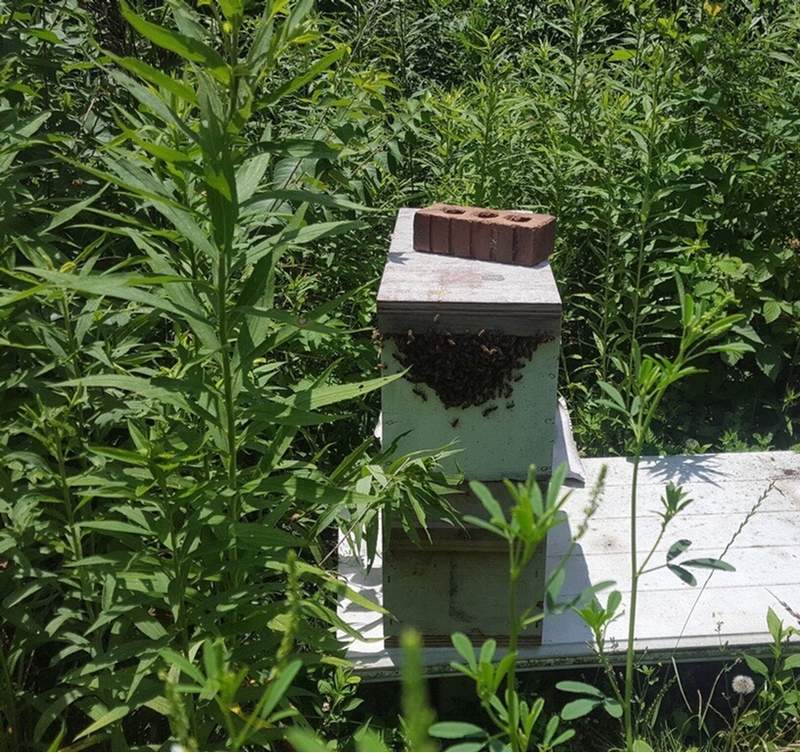 A couple of our neighbors had bees in places they did want them in and we rehomed them successfully to our hives. The 2 main factors for the Bees dying off are loss of habitat and pesticides. Here on the farm we do not use any chemicals or pesticides and continue to naturalize our acreage to provide a habitat for the Butterflies and Bees. We have also worked with our local road crew to not mow or spray the ditch line in front of our farm. They can fly at speeds of up to 25 km per hour and beat their wings 200 times per second. The average worker bee lives for 5 to 6 weeks and will produce a twelfth of a teaspoon of honey. The queen can lay up to 2500 eggs a day. Honey is rich in these vitamins and minerals: Vitamin B6, Calcium, iron, magnesium, potassium, zinc, riboflavin. It is these vitamins and minerals plus the natural inclusion of water that makes honey 82% sugar by weight, while sugar is 99.9%. This is why honey is alright for diabetics (my mom who is diabetic uses honey as a natural sweetener). We have two things that we like to infuse our Honey with, Mint and Honey. This writing is going to be about the benefits of Honey and Cinnamon. Honey is the only food that will not spoil or rot. It may do what is called “turning to sugar” or “crystallize”. When this happens, just loosen the lid and sit in a container of hot water and let it return to liquid. Never boil honey or put in the microwave, this will kill the natural enzymes in the honey. The combination promotes a stronger immune and digestion system, improves heart health, keeps skin, teeth, bones, and hair healthy. Can also help to stimulate weight loss. Mixing honey and cinnamon with one of our custom blended Red Teas could also have the potential to lower your risk of heart disease. It could help to lower the “bad” levels of cholesterol. The high levels of antioxidants and anti-bacterial properties are what can help to improve and strengthen the digestive system. Jeff and I continue to study and research Ayurvedic Medicine in which case Honey is known as “Yogavahi” this translates to “The carrier of the healing values of the herbs to the cells and tissues” When you add a herb or spice(cinnamon) the qualities of the honey enhances the medicinal value and helps them reach deeper in the tissues of the body to be used more effectively. When looking to purchase cinnamon for health benefits, look for Ceylon Cinnamon instead of Cassia Cinnamon. Cassia Cinnamon in the most commonly found in grocery stores. Both Cinnamons contain similar characteristics of antimicrobial but Ceylon is the medicinal powerhouse. Both contain Courmarin(a naturally occurring blood thinning substance) This substance can be damaging to the liver and kidneys if consumed in large amounts. Ceylon contains a very small amount of courmarin. Ceylon is tan in color, Cassia has a reddish tint. Ceylon has a sweet smell, excellent for pastries, desserts, honey. Cassia has a robust flavor, good for marinades. Stay tuned for the writing on the ailments and conditions this powerhouse combination can help.